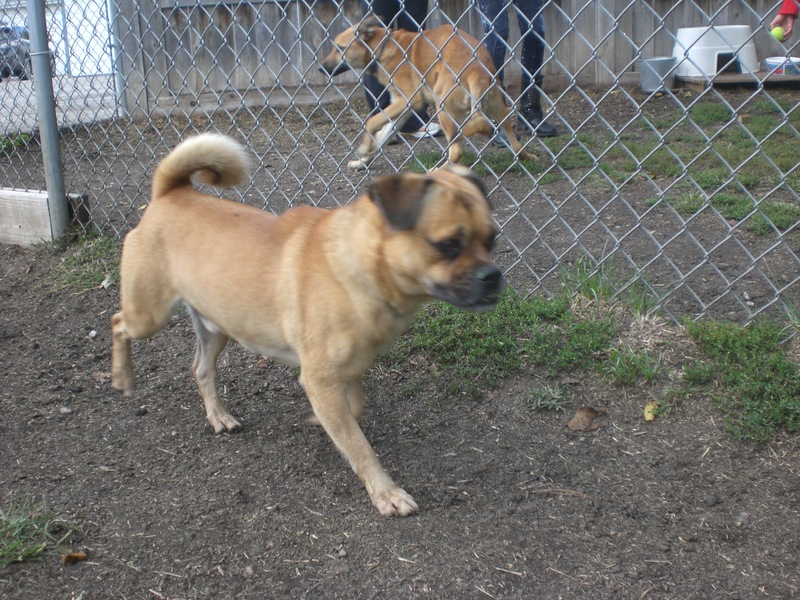 Frank the four-year-old Pug/Beagle mix is super cute. One look at that semi-squished Puggle face and you’re in love. Frank has plenty of energy in that little body of his, which meant he was very happy to have a chance to run around in the off-leash run. Frank was sharing his kennel with another dog while I was there, and was also very polite to the dog on the other side of the fence in the run, so he could go to a home with or without another dog. Frank has incredibly soft fur, which makes him extra snuggle-able. 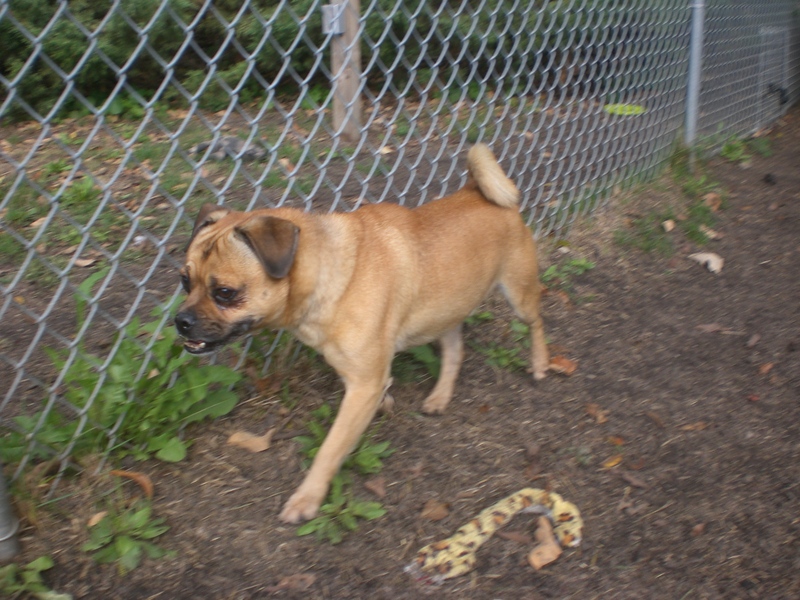 He also has that adorable curly tail from his Pug side. Everyone who saw him while we were out kept exclaiming over how cute he is, so he probably isn’t going to be staying at the shelter for very long. All of the other volunteers I talked to told me what a nice dog Frank is, and I have to agree with them! 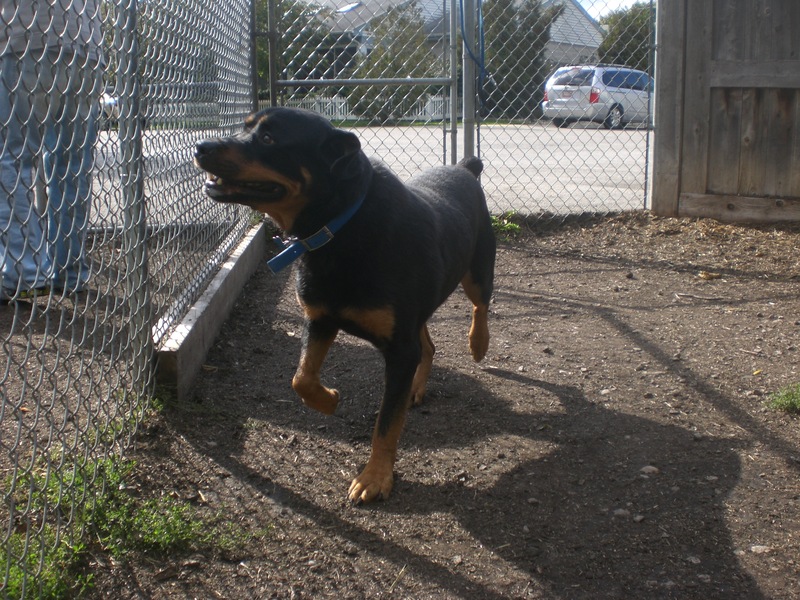 Stop by the shelter soon to see if Frank is the pooch for you! 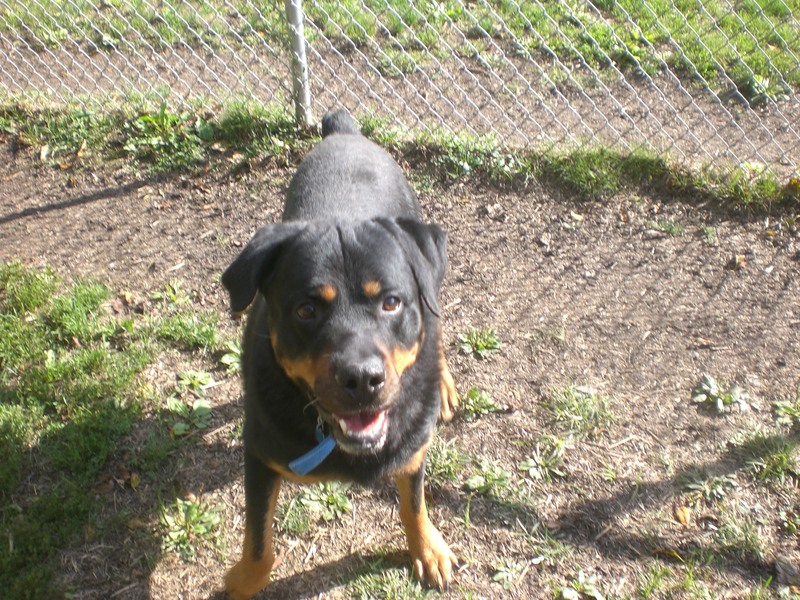 Toby the five-year-old Rottweiler mix is such a good boy. He’s also a big boy, which might make him seem a little intimidating, but he’s really just a giant softie. Toby seems to love everybody he meets and wags that little tail of his almost all the time. He appreciates a good scratch on the back and a hug, where he will take the opportunity to give you a doggy kiss. Toby is extremely well-behaved. He knows his basic commands and sat for me even though I didn’t have a treat to give him (shame on me). He can pull a bit on the leash when he first gets out of his kennel, but settles down and walks nicely soon after. He was interested in chasing tennis balls and good about bringing them back. Mostly, Toby just wants to love and be loved in return! That doesn’t seem like too much to ask for. If you’re looking for a big, sweet dog, come in soon to meet Toby! Sebastian the one-year-old Border Collie mix is definitely still in his puppy phase. He loves to run and play, something his kennelmate Blush (who loves to give doggy kisses) puts up with as politely as she can. 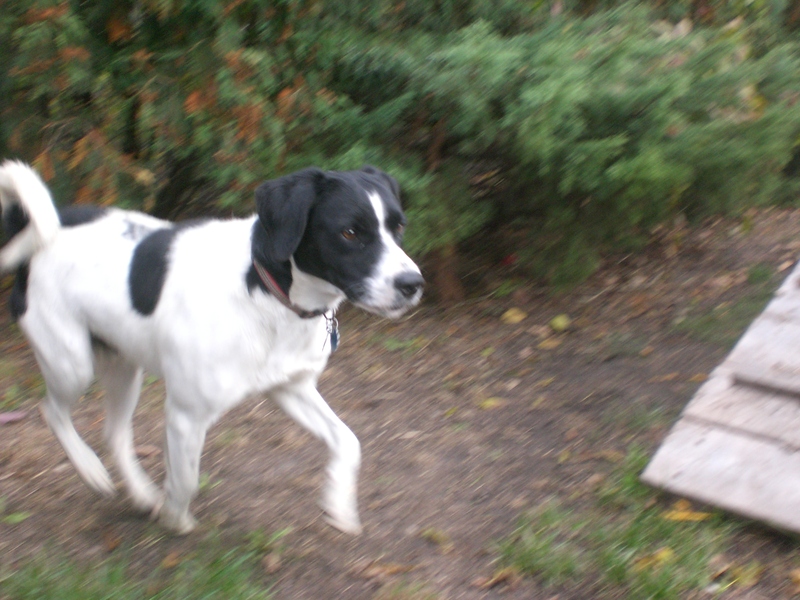 Sebastian led the way to the off-leash run and was scampering around, happy as a clam. He was also polite to the dog on the other side of the fence, so Sebastian is another pooch who could go to a home with or without other dogs. Sebastian eventually slowed down long enough to climb into my lap for a cuddle session, even though his back half didn’t quite fit. This puppy needs a family to show him what love is, and also a family who will be able to keep him both physically and mentally active–Border Collies are working dogs, and they love having a job to do (which is why you see so many of them in agility competitions). 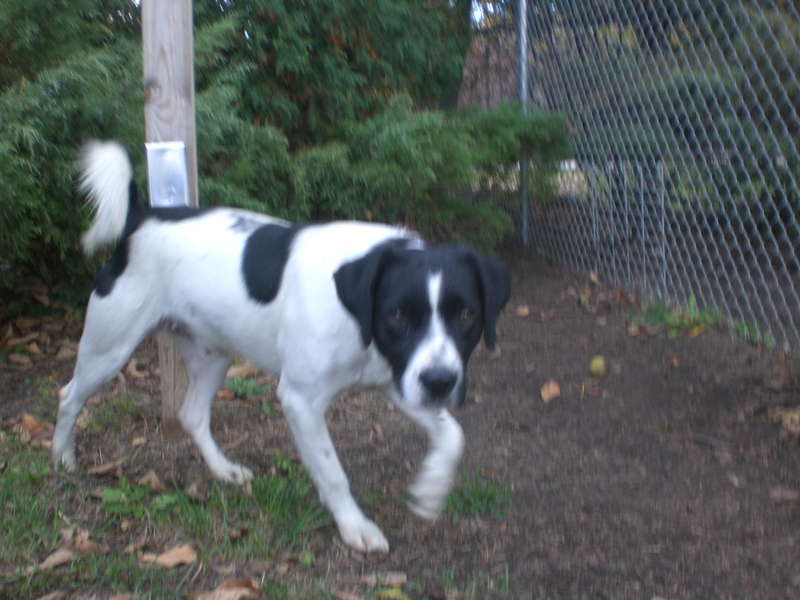 If you’re looking for a young, adorable dog who will grow into a great companion, Sebastian might be the one for you! I also spent some time with Diamond (who I had forgotten was such a snuggler! ), Ebbie (who doesn’t need a whole lot of exercise at her age but still appreciates a nice walk), Lucky (another Border Collie who will make a great companion), Akiva (who knows ‘sit’ and ‘shake’, among other commands), Frankie (who is just so sweet and gentle), Emerald (who is so happy to spend time outside), Corky (who is a good walking buddy), Star (who would be happy to be a couch potato with you), Topaz (who doesn’t care how big she is–she’s going to sit in your lap), Lady (who is very well-behaved), and Bella (who is very affectionate). So many wonderful pooches! Posted by Meet the Pooches on October 24, 2013 in Dog Profiles and tagged adopt, adoption, animal shelter, animals, Beagle, Border Collie, Chicago, dogs, Orphans of the Storm, pets, Pug, Puggle, Rottweiler.